Octavi Marti , UNESCO Courier journalist. Irrigation in the Ebro delta: are farmers abusing cheap water? What we call 'the water problem' in Spain is going to become 'the water war', predicted Spanish ecologist José Manuel Naredo in 1997. Three years later, the 400,000 people who marched through the streets of Zaragoza (a town of 650,000 inhabitants) on October 8 appeared to prove him right. Their target was the National Water Plan (NWP), unveiled by the government on September 5. The plan’s centrepiece is the diversion of a billion cubic metres of water each year from the River Ebro to occasionally or permanently arid regions on the country’s Mediterranean coast. For inhabitants of the province of Aragón, the 700,000 million pesetas (more than $3.5 billion) that the government intends to spend on building 529 kilometres of new waterways and several dams are simply 700,000 drops of water in a cup that is already spilling over. The opponents of the NWP have stepped up their attacks. They say water supplies can no longer be managed on technical criteria alone. The planned diversions are dangerous, they argue, because the Ebro basin has not had a water surplus for the past quarter of a century. But their main criticism is that the diversion of the river is completely unnecessary. Economic history teacher Enric Tello believes the answer to Spain’s water problems lies in 'reorganizing the supply'. He argues that the country is suffering from 'water schizophrenia' and that 'sooner or later taxpayers will wonder why they are still subsidizing the irrigation of crops that are already being subsidized and are often produced in excessive quantities'. This 'schizophrenia' arises, he says, from the huge gap between the price of water for irrigation, which is almost free, and the much higher cost of water used in cities and industries. So why not try to narrow that gap? The answer could lie in a small detail that both Tello and Naredo point to: Environment Minister Jaume Matas launched the NWP at the headquarters of the Public Works Employers’ Federation. The ministry offers a quite different spin. Officials say demand for water will keep on growing and requires the building of costly aqueducts. They agree that the irrigated area of around 3.5 million hectares should not be increased, but defend the river diversion plan and talk of building more than 70 new dams at a cost of three thousand billion pesetas (about $15.5 billion) over eight years. All of which clashes with a European Union directive defining every water catchment area as a distinct management unit and ruling out water transfers from one area to another. But the ministry insists it is no longer possible to 'go backwards'. declaring that the NWP 'will solve the water problem for good'. Spain’s 1,070 big dams already make it the world’s leading country in terms of proportion of dam-created lakes to total land mass. The fact is, however, that many serve no purpose, since for months on end they are filled to only five or 10 percent capacity. Spain began its first major river diversion scheme in the 1960s by linking the Tagus in the west and centre-west to the Segura in the southeast–a transfer of 600 million cubic metres of water a year. But in 1999, the province of Castilla, which the Tagus flows through, refused to supply a drop more than 40 million cubic metres, less than 10 percent of the amount originally planned. What had happened? Maize growing, which requires a lot of water, expanded in the regions along the Tagus (the Mancha and the Meseta). To irrigate today’s 150,000 hectares of maize, you need to draw heavily on underground water and also pump more from the Tagus. In Murcia (watered by the Segura), which benefits from the diversion scheme, irrigated areas have grown enormously. Biologist José Luis Benito notes that 'absurd though it might seem, the diversion of the Tagus has turned a hitherto occasional and irregular drought into a systematic and permanent one'. 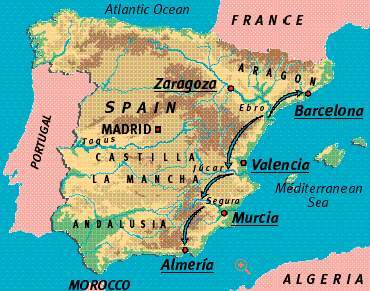 Forty million hectares of Spain have a Mediterranean climate. Because the rainy season and warm weather do not coincide, there is little vegetation. Planting maize, alfalfa, potatoes and beans in such a climate is not a particularly sound idea because these crops depend upon a lot of water. In the Mancha, for instance, it takes a tonne of water to produce a kilo of maize. If water was not subsidized, as Pedro Arrojo has noted in his study of the irrigated regions of Aragón, 90 percent of this land could not be profitably farmed. This has led the historian Tello into calling for a new agricultural policy based around sustainable development which would preserve subsidies for “maintaining balanced land use and other social and environmental reasons,” but hand out the aid directly to farms rather than using it to bring down the price of water, fuel and chemical fertilizers. If water for irrigation were not 100 times cheaper than water for industry, crops unsuited to Spain’s climate would be abandoned. But Tello has proposed a solution already adopted in the United States through the California Water Bank. This “market” allows farmers, at certain times of the year, to re-sell some of their water stocks to cities that need it. Because they make money from this, they can then grow crops that need less water, even if they are less profitable. So the cities get the water they need, the farmers do not lose money and water resources are not over-used. Tello has looked into the potential benefits of “a system that would penalize waste and encourage saving and recycling water.” Whenever industry has realized water can cost it 10 times less through careful planning, it has changed its patterns of use. Tello has also shown that investing 100,000 pesetas (about $500) to equip every household in Catalonia with electrical and water appliances that can save and re-use water would be cheaper than a projected scheme to channel water from the River Rhône, in southern France, to Barcelona, at a cost of around 200 billion pesetas (more than $1 billion). Taxing water in a more consistent way would solve another big problem: that of outdated piping. Pedro Arrojo has noted that the water network in Zaragoza was so leaky that no difference was registered between daytime and nighttime consumption. In the market gardening area around Valencia, the price farmers pay for water is fixed by the amount of land they need to irrigate, meaning that losses caused by faulty piping are generally ignored. Another example is the Jucar imperial canal, which is built directly in the earth and results in massive leakage. Spain gets 346 billion cubic metres of rainfall each year, of which 109 billion remains after evaporation. This should be enough to meet an annual demand of 35 billion cubic metres, 80 per cent of it for agriculture, which usually pays one peso per cubic metre. In areas where the price of water for irrigation is higher (30 pesetas a cubic metre) because it comes from desalination plants or from underground, farming is very sophisticated. Almería, which 20 years ago was Spain’s poorest province, is today the country’s fastest growing one and relies upon the most foreign labour (which is neither welcomed nor assimilated). Because yields are very high, the province has 13,000 hectares of land that are illegally irrigated. The diversion of the Ebro is an ineffective response to Spain’s cultural, social, political and economic problems. Opponents of the scheme say it even creates new difficulties: the defenders of the environment are especially worried that the Ebro delta, the country’s second biggest ecological reserve, might disappear. Since the end of the 19th century, sediment in the river has dropped by 95 percent. As a result, the government has to invest about 20 billion pesetas ($100 million) to add sand to some beaches. One thing is nevertheless certain: if desertification continues to advance in Spain, the country will not be needing extra sand.